Me with the white English shirt, suede vest, black horse named Silver and still winning ride. How improbable! I may have told this story in some format before, don’t want to bore you, but a recent Facebook sighting brought this all vividly back to my mind. We used to live in Florida. Ally started taking English lessons when she was about 10. Shortly thereafter, we purchased our first horse for the family. I was in the midst of a divorce. I was only working part-time. I had horses throughout my entire life except for this last four years in Florida. I saw an ad for an Anglo-Arab (a registerable cross between a thoroughbred and an Arab) that was related to my favorite horse, Man O’War and I was ready to buy her. Her name was Silver but she was not. She was an almost black, good-sized mare that would ride western or English and jumped some. Actually, we learned she jumped a lot. I fell off her the first day I tried her out, badly sprained my ankle, but still went back and bought her. On the jumping side, I would take her to the paddock and go back to clean her stall only to find her standing next me a few minutes later. So, the owners did not mention she would just jump out of the paddock, pasture, arena whenever she wanted. At first I thought I must have left the gate open but soon watched her do her little feat. So, much for that. She obviously could jump. All of us, Ally, young Lauren (6) and myself were having to either learn to ride or get back in shape to ride like we used to (that would be me). I would go to the barn while the kid’s were in school and spend hours practicing my riding. Stopping, starting, cantering from the halt, picking up the correct lead, and doing good changes of diagonal at the trot. I had heard there was going to be a show at the Park arena and I wanted to try to ride. It had been decades, literally, since I had shown in a pleasure class. I think of Caitlyn practicing her equitation rounds over and over when I remember my focus of those early days with Silver. Not much was going right in my life then but on the back of this horse, I felt confident and positive. One day, the lady I recognised as Kit Kope, was giving lessons in the main arena. I knew she was going to be the judge for the upcoming show. I got up the nerve to ask how she thought we would do and if she had any suggestions. She looked at the old western saddle that I was riding in (it was my prized saddle of my father’s-a treasure to me-a show saddle not) and she evaluated my horse (in western pleasure typically you are looking for a stock type Quarter horse or Paint horse). My Silver was a little leaner and had bigger stride owing to her thoroughbred background. Most stock judges don’t really like thoroughbreds or Arabians so the combination of those doesn’t often earn the ribbons. Kit told me to work on polishing up the saddle if that was all I had. She told me I needed a better saddle pad and show bridle. She said I was doing okay with the mare-she had noticed me several times practicing when she was there with students. I was quite disappointed. I did not have a show saddle, bridle or pad. I did not have one of the those cute western pleasure outfits with bright colors and matching chaps. I was going to scratch the class but decided to give it a shot if nothing more than to get the mare ready for Ally to show. The day of the show, I had decided it would be convenient to wear my English show shirt under this corny leather/suede vest with black jeans, brown boots and a black cowboy hat. What a winning ensemble! I watched the number of entries continue to add until there were 25 riders going into the class. I constantly calculate odds in my head and I knew the odds of coming out with a first through eighth place ribbon had gotten pretty slim. So, I went in the ring and talked to my departed father and God. I thanked them for teaching me this love of riding. I sat tall in my father’s old saddle, heels down, hands quiet. I thought it went okay. I saw a few mistakes around the ring as some horses pulled the incorrect lead or did not halt or walk on well. I have to tell you cantering with 25 horses in a ring together was a little frightening but Silver did well for me. Finally Kit called for the horses to line up. I looked up and down the line and saw lots of fancy quarter horses and paints with show saddles gleaming in the sun. I pushed my heels a little farther down in the stirrups and sat straighter in my saddle. 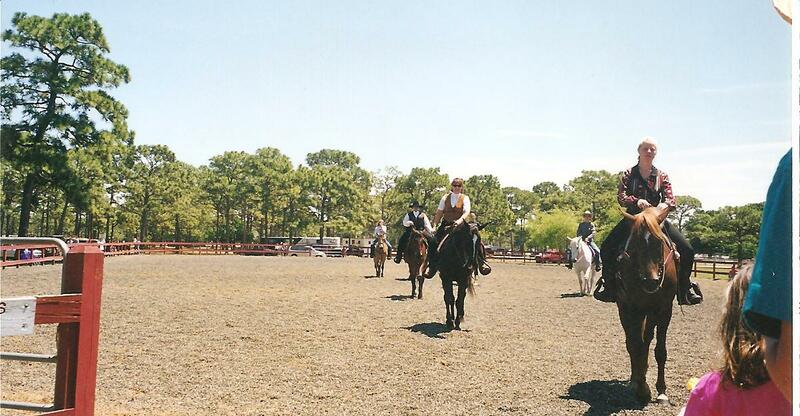 I was overwhelmed at that moment with how close I felt to my dad, riding in his saddle, enjoying this sport he loved. In Florida, when they call the placings they start from eighth place and go to first. I held out some hope for a ribbon as eighth to about fourth place were announced. From that point on, I figured I was out of luck. There were too many sharp horses still left unribboned. I told myself, I had gotten back in the ring, I had worked hard and there would be more shows. No one was more surprised than I when my name was called for first place. I had won the class! I was so thrilled, I think I may have shed a few tears. So many terrific young riders on top horses with the right saddles and right clothes and I-the 40-year old lady had won. Later, Kit (the judge) took over as Ally and Lauren’s trainer until we moved to Texas. She was always tough and always fair. I have followed her career seeing her progress in her judging up through the ranks of the Paint Horse Association. I would be reading my Paint Horse Journal in Texas and catch sight of her picture-Kit Kope of Cocoa Beach, Florida. The other day, an old Florida friend of Ally’s back in the Florida days posted a picture of her young son on Facebook. I commented on how handsome he was and right below my comment was one from Kathyrn Kope. Her picture showed a paint horse and cowboy hat. I quickly messaged her. I am not sure she remembered us-at that time Ally’s next horse (a Rugged Lark mare) was more memorable that we were. Still it was great to be able to tell her how much she had meant to me and my girls and what she taught them. Of course, I have used this work hard, practice, practice some more and don’t worry if you have the best equipment or best horse story a million time. It is one of my best stories because it is true and right and honest. Thanks Facebook, for putting me in touch with someone who helped shape the life of my girls and I. This entry was posted in Horses and tagged APHA, judging horse shows, kit kope by Exechorseluver. Bookmark the permalink.